Based on the promises we made in our ambitious What’s Next plan, we’re excited to announce that we’re introducing all-new, more powerful, flexible automation features. 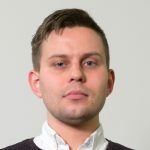 Automation is a crucial aspect of email marketing in the new age of ecommerce, and it’s one that helps ecommerce merchants respond quickly to a customer’s behavior and needs. In fact, that’s one of the reasons why we’re really throwing so much of our effort into marketing automation, as it is based on the customers: helping merchants build better relationships with their customers through constant, needed attention at just the right time. Today we’ll look at what our new flexible automation is all about by looking first at the customer journey, and then we’ll show you 5 great ways you can use automation to help provide value to your customers and boost your sales. 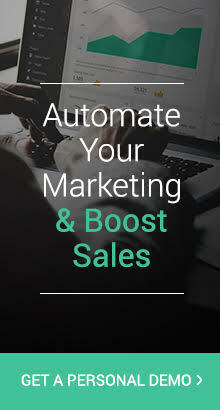 Marketing automation is a way for you to set up customized emails that will go to your customers and subscribers at the right time. With automation, you determine what that right time is and what the content of the email should be. When thinking of automation, it’s better to think of it in terms of your customer’s journey. By understanding how your customers interact with your store at the beginning, middle and peak of their relationship with you, it helps you to adapt to their needs and provide them with greater value. This also helps merchants understand what actions they need to take at the right time to get their customers to convert. All customers have a general journey that they follow, from the first time they visit your store to the last time they buy from you. This usually includes first contact (social networks, ads, etc. ), visiting your store, subscribing, initial purchase, repeat purchase, and then completing their journey. Here, the Subscriber section allows you to edit any automated emails related to subscribers. This includes welcome and birthday emails. 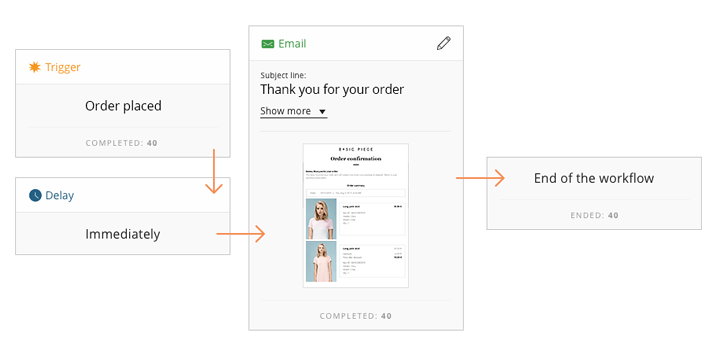 For Shopper, you can edit cart recovery emails to remind shoppers to finish their purchases, while the Buyer section allows you to edit the automated Order Confirmation email sent out after a customer makes a purchase. Lastly, there are the Repeat buyer workflows, which include Customer reactivation (for customers who haven’t purchased in a while) and Order Follow-up. For more information on how to use the updated workflows, check out our Knowledge Base article on Automation Setup. Now that you’ve got a pretty good understanding of what marketing automation is and how it works at Omnisend, you’re probably eager to get started on it. Below are 5 great ways you can use these new workflows to not only provide extra value to your customers, but also to increase your sales. With Omnisend’s updated automation, you can send different welcome emails to your subscribers based on the signup form they used to subscribe. For example, if your subscriber signed up because of your 15% off discount, you should send a different email than a subscriber that signed up because of your resource on how to choose the best scarf to match your outfit. This is also good for your Black Friday email campaigns (including for Christmas sales), so that you can give a customized welcome message for the busiest shopping season of the year. In your welcome emails you can offer discounts, free shipping, or free gifts on your hottest items or you can lead them to other important pages on your site. People abandon carts for different reasons. One of those could be the timing. When the Black Friday Cyber Monday weekend rolls around, many people are shopping around religiously and bouncing from one site to another to find the best deal. Sometimes they simply forget about the great deal they saw or simply are too busy to buy at the moment. That’s when a well-timed reminder is key. 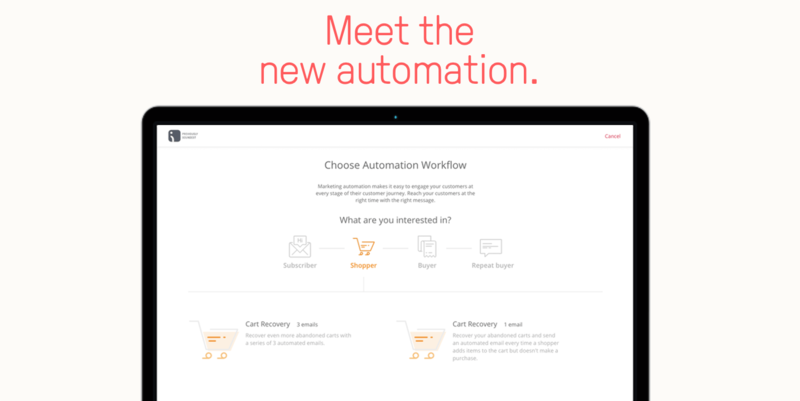 Because it’s the biggest shopping weekend of the year, send your best offers with the 3-email cart recovery automated workflow. Just customize your cart recovery workflows before Black Friday and remember to adapt them when your campaign ends. Then, edit those workflows for your next promotional campaigns, such as for the remaining Christmas shopping season. You may not know it, but birthday emails have a 45% open rate—more than double the open rate for regular promotional emails. And it’s quite easy to understand why. Birthday emails are highly personalized, as the recipient knows that it’s only for them. They are also in a happier mood, eager for gifts, and it’s the perfect time to send them a unique offer. Again, this can and should be something spectacular, like a 25% discount (or higher) or free shipping for up to one week on all products. And, of course, with automation workflows, you only have to set this up once and enable it to go out for your subscribers. You can choose to send it out on the birthday, a few days before or a few days after. Just make sure you gather their birthdates on your signup forms. A customer’s lack of engagement may not be disinterest from a customer’s side. Actually, it’s more likely due to a lack of attention from the merchant side. After all, if the customer bought from you and enjoyed your product, they’re very likely to buy again. That’s why you need to send them regular, interesting emails to keep their interest. You can do this most effectively with two automation workflows: the Order Confirmation and the Order Follow-up. The Order Confirmation workflow should be set to go out to the customer immediately after they’ve made a purchase. You can include featured products or even an interesting offer for their next purchase. The Order Follow-up should go out one week after purchase or later in order to get feedback from your customer about their enjoyment of the product. This will help you gather enough information to improve your products to provide even greater value. You can also use this opportunity to send an offer and keep them engaged. If you know your average purchasing cycle, you can set up your Customer Reactivation workflow to go out after the customer that hasn’t made a purchase for a specific amount of time. That way, you won’t send out the email (and included offer) too early or too late, when the customer has already forgotten about your brand. This is especially important for the upcoming Black Friday Cyber Monday weekend, when many customers will make purchases from your store, to eventually fall along the wayside. This is good neither for the customer nor the merchant, as the customer won’t be able to enjoy more value from your other products. And it’s bad for the merchant, as the customer’s lifetime value will be drastically shortened. When you’ve set up your new automation, with our new workflows, you’ll be able to reach the right customers at the times when they need and want your messages the most. With that, you’ll have happier customers, more conversions and much better sales.